Can Staples Find A Buyer And Stay Alive? Shares of the popular home/office supplies retailer, Staples, spiked almost 12 percent—to $9.68—in late morning trading on Tuesday on the heels of a potential sale. The company, of course, has been struggling to keep pace with the market, particularly following a federal judge blocking the company from merging with the smaller competitor, Office Depot, over antitrust issues. This, of course, saw both brands losing ground in the market with Staples falling to its lowest share price in two decades: $7.75. 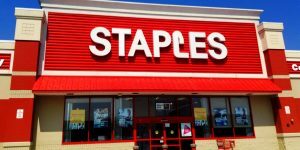 Staples had made this initial offer (to buy Office Depot, a company which had only a few years before absorbed competitor OfficeMax) in a cash-and-stock deal worth $5.5 billion. Former Staple’s CEO Ron Sargent had argued to shelve the government’s anti-trust concerns because Amazon was already a major force in business services. Now, this was not the company’s only speed bump. Overall, the company’s stock fell 46.22 percent in 2015, slipping another 4.44 percent last year. But the struggles that Staples are facing are nothing new. Companies across the retail industry are finding physical sales slowing thanks to improved convenience and prices from companies like Amazon. Amazon, of course, carries everything from home furnishings to linens to apparel to electronics to, obviously, office supplies. After all, have you ever needed a package of pens or pencils so badly that you had to run out to the store immediately? No. Probably not; you would rather save a few bucks and wait a couple days. And Staples knows this, too. The company has made a successful shift to the web and now earns more than 65 percent of its $18 billion in annual sales—and roughly 75 percent of its profits—from orders placed through the online portal. Here’s a surprising nugget: Staples is actually the fifth largest seller of online goods (followed by, in order: Amazon.com, Apple, Dell, and Wal-Mart Stores). Silverman goes on to say he expects the company will continue find ways to cut costs and close stores.